If you enjoy herbal teas, flaxseed tea could be a flavorful choice. Also called linseeds, flaxseeds are harvested from the flax plant and have been part of traditional medicine for hundreds of years. Modern research suggests that flaxseed components may help support heart health, prevent cancer and offer other possible health benefits. Up to 50 grams of crushed flaxseeds daily is generally considered safe for healthy people, but don't drink flaxseed tea if you're pregnant or breast-feeding. The tea might cause a reaction in people allergic to the flax plant, and it might also cause some mild digestive upset. Before drinking the tea regularly, discuss its use with your doctor to decide if it's a good choice for you. Flaxseed and flaxseed tea contain polyunsaturated omega-3 and omega-6 fatty acids, along with a group of natural compounds called lignans -- all compounds with biological activity. The results of many research studies suggest that a diet rich in flaxseed is heart-healthy, potentially helping lower levels of cholesterol in your blood and possibly reducing your risk of atherosclerosis and other types of cardiovascular disease. A clinical study published in June 2008 in the "British Journal of Nutrition" evaluated the effect of consuming a flaxseed lignan extract or placebo for eight weeks in a group of 55 subjects. The authors reported that those taking the extract had 22 percent lower total cholesterol, along with 24 percent lower levels of low-density lipoprotein, or "bad" cholesterol, compared to the placebo group. These promising findings still need confirmation in larger trials. Omega-3 fatty acids and lignans in flaxseed are both antioxidants that can help protect your cells and tissues from free radicals, which form during digestion, when you're exposed to toxins or in your skin when you're in sunlight. Over time, free radicals can damage cellular DNA, possibly raising your risk of cancer and other diseases. 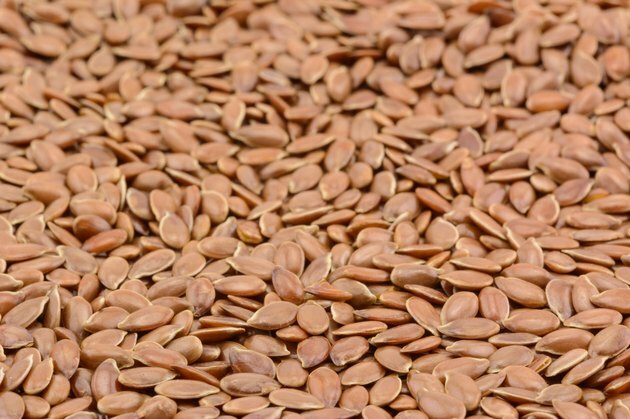 Experts at Memorial Sloan Kettering Cancer Center report that flaxseed slows the growth of prostate, breast and skin cancer cells in culture and in laboratory animals. Several clinical studies also suggest that flaxseed components might help slow cancer growth in humans. For example, a study published in the May 2005 issue of "Clinical Cancer Research" found that subjects with breast cancer who consumed flaxseed for 30 to 40 days had reduced levels of cancer-related markers, compared to a placebo group. These possible anti-cancer benefits still need further study in large clinical trials. Components in flaxseed tea might also help slow or reduce the rise in blood sugar that occurs after you eat, potentially lowering your risk of developing Type 2 diabetes. The study published in the "British Journal of Nutrition" in 2008 found that subjects who consumed flaxseed extract also had significantly reduced blood sugar, in addition to improved cholesterol levels, compared to controls. Because some flaxseed compounds are phytoestrogens, which act in similar ways to estrogen, flaxseed tea might also help improve mild symptoms of menopause. A study in the September 2002 issue of "Obstetrics and Gynecology" found that menopausal women who consumed a flaxseed supplement for two months had improvement in symptoms comparable to that seen when women received hormone replacement therapy. Flaxseed is available as whole or ground seeds, finely ground flaxseed meal and tea bags. To make tea, steep 1 teaspoon of ground seeds, 2 tablespoons of meal or one tea bag in about 1 cup of boiling water for 10 to 15 minutes with loose tea or two to four minutes with a tea bag. Strain the hot liquid and, if desired, add some cinnamon or honey for extra flavor.